This example simulates and explores the behavior of a simple pendulum by deriving its equation of motion, and solving the equation analytically for small angles and numerically for any angle. The pendulum is a simple mechanical system that follows a differential equation. The pendulum is at rest in a vertical position. We displace the pendulum by an angle θ and release it. The force of gravity pulls it back towards its resting position, its momentum causes it to overshoot and come to an angle -θ (if there are no frictional forces), and so forth. The restoring force is -mgsinθ, the gravitational force along the pendulum's motion (with a minus sign to remind us that it pulls back to the vertical position). Thus, according to Newton's second law, the mass times the acceleration must equal -mgsinθ. Substitute for a by using subs. Isolate the angular acceleration in eqn by using isolate. This equation is difficult to solve analytically because it is non-linear. Assuming the angles are small, we can linearize the equation by using the Taylor expansion of sinθ. Solve the equation eqnLinear by using dsolve. Specify initial conditions as the second argument. Simplify the solution by assuming ω0 is real using assume. From the equation, the time period is directly proportional to the pendulum's length. However, t0 does not depend on the mass because its moment of inertia and its weight are both directly proportional to its mass. The time period does not depend on the initial conditions but the amplitude does. Instead, the period is governed by the equation of motion. Plot the motion of the pendulum for the small angle approximation. theta_0Value  = 0.1*pi; % Solution only valid for small angles. theta_t0Value = 0;      % Initially at rest. 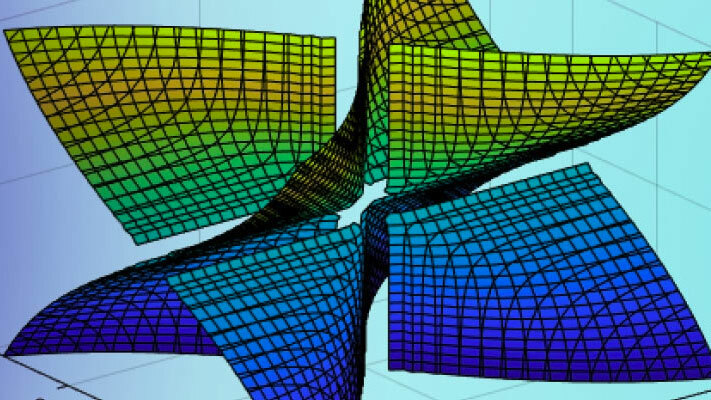 Substitute physical parameters and initial conditions into the general solution. 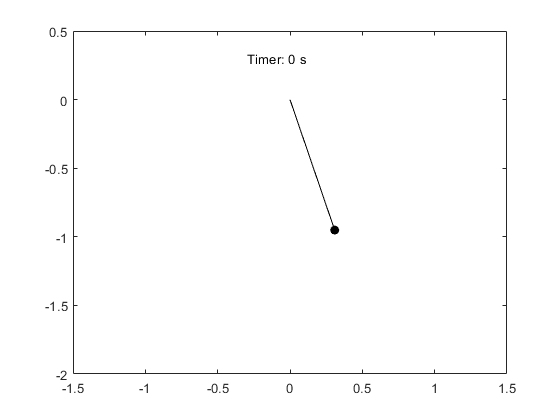 Having found the solution for θ(t), we can visualize the motion of the pendulum below. 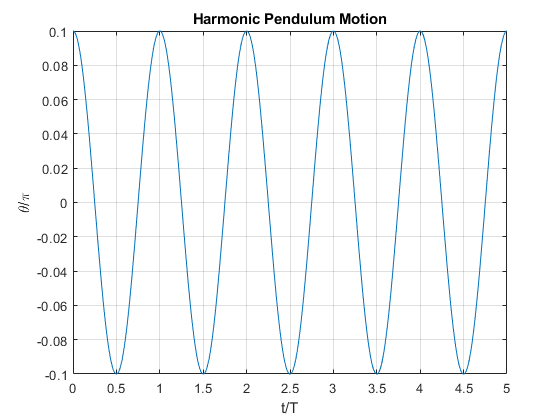 To understand the non-linear motion of a pendulum, visualize the pendulum path by using the equation for total energy. Since the non-linear motion must conserve total energy, paths that have constant energy describe the non-linear motion. E=12m r2(dθdt)2+m g r (1−cos θ). Since energy is conserved, the pendulum's motion can be described by constant energy paths in phase space, which is the abstract space with coordinates θ vs. dθ/dt. We can visualize these paths using fcontour. The curves are symmetric about the θ axis and dθ/dt axis, and are periodic along the θ axis. There are two regions of distinct behavior. The lower energies of the contour plot close upon themselves: the pendulum swings back and forth between two maximum angles and velocities. The higher energies of the contour plot do not close upon themselves because the pendulum always moves in one angular direction. The non-linear equations of motion are a second-order differential equation. Numerically solve these equations by using the ode45 solver. Because ode45 only accepts first-order systems, reduce the system to a first-order system. Then, generate function handles that are the input to ode45. Find the mass matrix M of the system and the right sides of the equations F.
Convert f to a MATLAB function handle by using odeFunction. The resulting function handle is input to the MATLAB ODE solver ode45. Solve the ODE for the closed energy contours by using ode45. 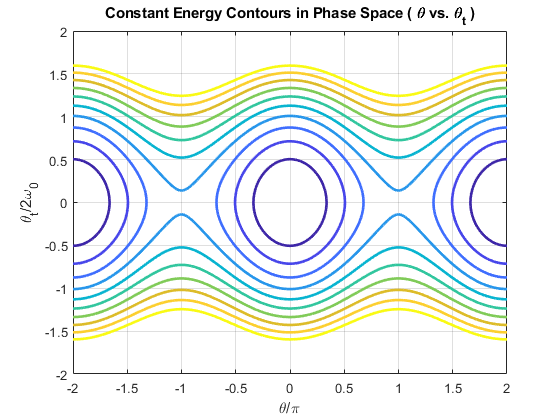 From the energy contour plot, closed contours satisfy the condition θ0=0, θt0/2ω0≤1. Store the initial conditions of θ and dθ/dt in the variable x0. Choose a time interval that allows the pendulum to go through a full period. This can be found by trial and error. θ is returned in the first column of x, and dθ/dt is returned in the second column of x. Make the values of θ repeat on the interval (-π,π) using wrapToPi, then scale θ by π. 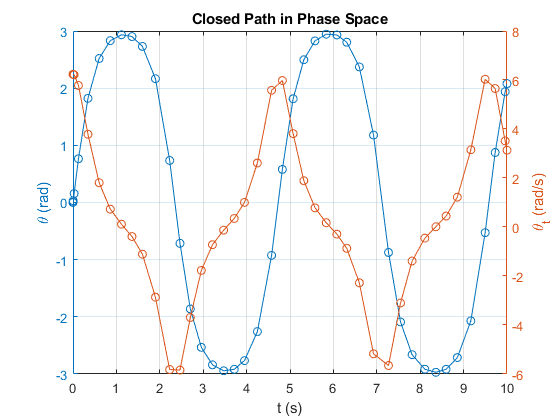 Plot the closed path solution. Solve the ODE for the open energy contours by using ode45. From the energy contour plot, open contours satisfy the condition θ0=0, θt0/2ω0>1. We have derived the simple pendulum's equation of motion, linearized and solved its equation of motion analytically, visualized its energy contours to understand the system qualitatively, and solved the general equation of motion numerically for particular initial conditions.